Home / Articles / 2015 / MRO Q&A: Which Maintenance Type is Best for our Equipment? A reader asks about the difference between reactive, preventative, predictive, condition-based TPM and autonomous maintenance. Question: There is reactive maintenance, preventative maintenance, predictive maintenance, condition-based maintenance, total productive maintenance and autonomous maintenance. Which of these is the ultimate way to maintain our equipment? 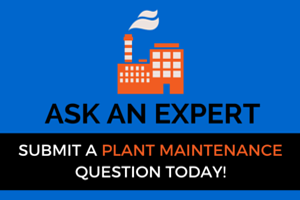 Answer: You touch on two distinct aspects of maintenance. Reactive, preventative and predictive maintenance are all processes that determine “what” you are going to do. In reactive maintenance you make the decision to do only what is needed to maintain operations. This decision should be based upon the fact that no excessive downtime would result if a failure occurred. In preventative maintenance, you do what is needed to make sure unacceptable production lapses do not occur. This approach is based upon factual data from past failures and the meantime between failures for similar components. Preventative maintenance is practiced on equipment that performs the same job in a repetitive manner, and the work required typically is determined by throughput or number of hours run. With predictive maintenance, the equipment being monitored does not necessarily perform linearly. An example would be an ammonia compressor that experiences higher loads and wear during the summer than it does during the winter months. Condition-based maintenance is needed to monitor the equipment’s vital signs. Lubrication purity, operating temperature and amperage pull are monitored to predict what needs to be done and when. The second aspect of maintenance pertains to who does the work. In total productive maintenance (TPM) the overall objective is to improve Overall Equipment Efficiency and typically involves a team of employees working together to reduce all stoppages, including mechanical changeovers. Autonomous maintenance is a component of TPM in which the operator performs as much maintenance and adjustments as possible to the machine he/she runs. The ultimate way to maintain your equipment is indeed situational. All of the above techniques should be measured to determine which is appropriate in your case.